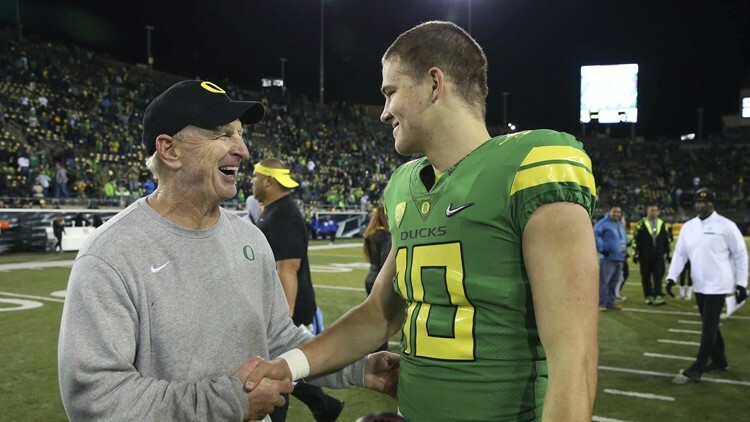 Oregon defensive coordinator Jim Leavitt, left, congratulates quarterback Justin Herbert after an NCAA college football game against Arizona, Saturday, Nov. 18, 2017, in Eugene, Ore.
Oregon will reportedly hire its next defensive coordinator from within the program. EUGENE, Ore. — Oregon and defensive coordinator Jim Leavitt have parted ways, according to multiple reports. It’s unclear why Leavitt is leaving the program, but Matt Prehm of 247sports reports Oregon is expected to promote co-defensive coordinator Keith Heyward to defensive coordinator, and the search for a new linebackers coach is underway. Leavitt was hired by former Oregon coach Wille Taggart prior to the 2017 football season. The Ducks interviewed Leavitt for the head coach position after Taggart left Oregon for Florida State, but hired Mario Cristobal instead.